Located at the confluence of the Mississippi and Elk Rivers, the community of Elk River, Minnesota has been called the “City of Energy,” a reference to its long history of harnessing the power of its two mighty waterways. 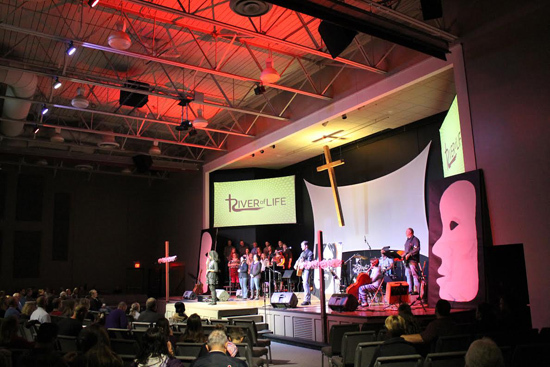 This tradition makes Elk River a fitting home for River of Life Church, a house of worship that radiates positive energy as evidenced by its many outreach programs and dynamic worship services. The environment inside the roughly 6,000-square-foot house of worship matches the vibrant character of its services, thanks in no small measure to a high impact lighting design created by Excel AV Group (Maple Grove, MN) that uses the Rogue R2 Spot moving head and COLORdash Par-Quad 18 LED par-style fixture from CHAUVET Professional to engage worshippers. This was the second phase of a long range project; an earlier phase also utilized CHAUVET Professional variable white LED fixtures for dimmable congregation illumination. Excel AV Group delivered this movement, color, and energy by replacing the church’s old incandescent par can lights and dimmers with 4 Rogue R2 Spots and 10 COLORdash Par-Quad 18 fixtures. The goals were to provide more even illumination, color wash, and energy, while providing maximum value per dollar. The church also needed extreme flexibility, meaning they can put any light fixture anywhere over the congregation or stage, to highlight each sermon series. With the four R2 spots, they can put color and gobos on any surface in the room or on stage. While the Rogue fixtures are typically used as fixed position spotlights with color, dimming, and position, at other services they serve as traditional movers with gobos and movement. River of Life uses gobos from the Rogue R2 Spot as breakup patterns on floors and walls. In the future, the church is planning to use custom gobos with its logo and sermon series. The COLORdash Par-Quad 18 fixtures are powered by 18 7-watt Quad-Color LEDs and work well with the low (23-foot) ceiling, thanks to their bright output and 18° beam angle. The presence of amber LEDs allows the fixtures to create the rich vibrant colors that the church was seeking. With CHAUVET Professional, Excel AV Group was able to exceed the design criteria and expectations, provide the power, flexibility, and reliability required, and do so within a very realistic budget.